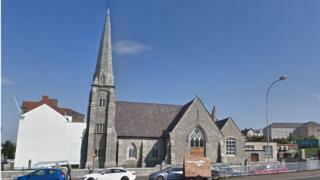 Police are treating an attack at a church in Newry as a hate crime. A stained glass window was damaged at First Presbyterian Church on John Mitchel Place between Wednesday evening and Thursday morning. It is the second time the window has been broken in the last year, with repair work only completed two weeks ago. Rev Norman Hutton said it was "extremely upsetting" for the congregation and local community. "Passersby discovered the damage yesterday evening," he explained. "The church is the longest standing and oldest Presbyterian congregation in Newry. "We haven't even got the final bill for the initial repairs which were just completed around a fortnight ago." Mr Hutton added: "The church has undergone, over the last three or four years, a complete refurbishment on the outside and it's in prestige condition at this present time. "But it's very upsetting for the people in the area who were delighted to see the church put back to its former glory."